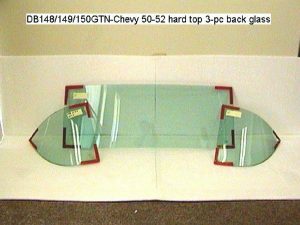 Listed here is the 3 piece rear windshield on the 1950-1952 Chevy Belair 2dr Hardtop tinted green. The picture to your left shows this glass tinted green.. The Belair model started in 1950 and was assigned to the Hardtop. Unlike later years when the model Belair included both 2dr and 4dr cars, in these beginning 3 years only the HT was a Belair. I have included a second picture showing the difference between the clear, tinted and smoked glass for clarity. Green tint on the left, smoked glass in the middle and clear to your right. In a different location, on the website, I will be listing these pieces of glass sold individually.